Hydrogen reformer tube assessment and life predictions require specific inspection and multi-parameter computations to provide plant operators with realistic usable data. 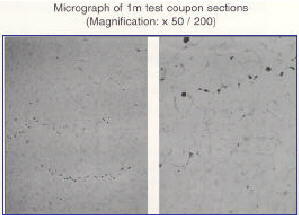 A series of non-destructive examinations are used to determine tube condition. These inputs are married with a series of deterministic and finite element calculations for remaining life prediction. A custom software program and inspection technology is outlined in the discussion. Reformer tubes normally used in the refining, petrochemical and fertilizer industries are manufactured by the centrifugal casting process and heat-resistant austenitic alloys such as HK -40, HP-40, and HP -Niobium modified materials. A design life of 100,000 operating hours has been the normal time-based criteria for considering retirement of tubes. Many operators of furnaces using such tubes desire to change their maintenance philosophy for tube retirement to condition-based assessment rather than time-based assessment. At a cost of several thousands of dollars per tube and a retubing cost of $1MM-$4MM, a significant amount of capital can be inadvertently applied if tubes are retired either too early or too late. There are many reformer furnaces remaining in service beyond the 100,000 operating hours criteria. To reduce the occurrences of furnace tube removal for condition-based assessment and to improve overall reliability of tube life, the use of NDE techniques on a regular basis during reformer furnace turnarounds is beneficial. The condition of a reformer tube is inferred from the response of a NDE sensor to a change in material properties. As such, there are certain limits on detectability, sizing and characterization of flaws that are heavily dependent on the overall test system characteristics, comprised of the environment, instrumentation, sensor, material under test and, of course, the operator. Yet, recent findings show that in some cases, significant growth may be apparent, but the tube may show the absence of internal damage. 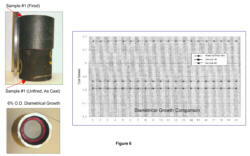 (1) Using diametrical growth (O.D. and I.D.) may provide a very general indication of tube condition; however, using diametrical growth as a stand alone method for measuring creep damage, or lack of damage as the case may be, may lead to a significant false call on the actual condition of the tube. The issue is further complicated by the fact that no tolerance is given by the manufacturer for tube O.D. measurement; and the tube I.D., while machined, can vary greatly over the length of the tube segment. In fact, the machining process may produce a given I.D. dimension, but because of the variation in the machining process, the tube may see a significant reduction in wall thickness on one side of the tube while having an abundance of material. on the other. 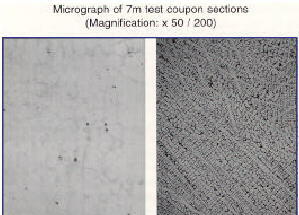 While four different samples from the same tube (Figure 1, 2, 3 and 4) had significant changes in creep damage, it is only when the tube reached macrocracking that a noticeable change in the O.D. or I.D. dimension occurred (Figure 5A). The above scenario is not always the case, as is demonstrated in Figure 6. These tube segments represent fired and unfired samples from the same tube. Significant diametrical growth (6%) is noted at both the O.D. and the I.D., well within the guidelines for tube replacement. Note the total degree of damage is much less than expected (Figure 7). Isolated and aligned voids extend approximately 60% through the wall thickness. Only through the application of other techniques was the true condition of the tube determined. To assess diametrical growth, manual strapping of the tube is often performed, and the results are tabulated per tube, at specific locations on the tube (normally at burner locations). As this technique tends to be tedious, time-consuming and requires scaffolding, automated techniques have been developed. Current automated techniques include eddy current proximity sensors and displacement sensors. The 'H' SCAN ׂ displacement sensor is attached to a scanning head that traverses an in-situ tube and records the diameter measurement at pre-determined intervals indicating the precise location of suspect diameter changes. The output of the tool is input directly into the software spreadsheet for data recording and analysis. A typical finished chart is shown in Figure 5B, note the difference in O.D. measurements of the three tube segments. This is a result of the manufacturing variations. Due to these variations, it is preferable if baseline data can be obtained on the tubes when initially installed so accurate trends may be developed. As creep damage occurs, an apparent decrease in wall thickness is evident. 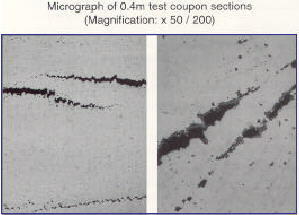 As an example, average wall thickness measurements were obtained from a tube that had been sectioned at 0.4m, 1.0m, 7.0m, and 11.0m positions; the metallographic condition is depicted in Figures 1, 2, 3, and 4, respectively. (2) There is an apparent decrease in wall thickness for these four sections of tubes, as shown in the graph of average wall thickness in Figure 8. Replication is useful for in-situ assessment of reformer tube outside surfaces, to detect overheating that causes microstructural changes. Replication is a "spot" type assessment and is normally used as a supplemental technique. 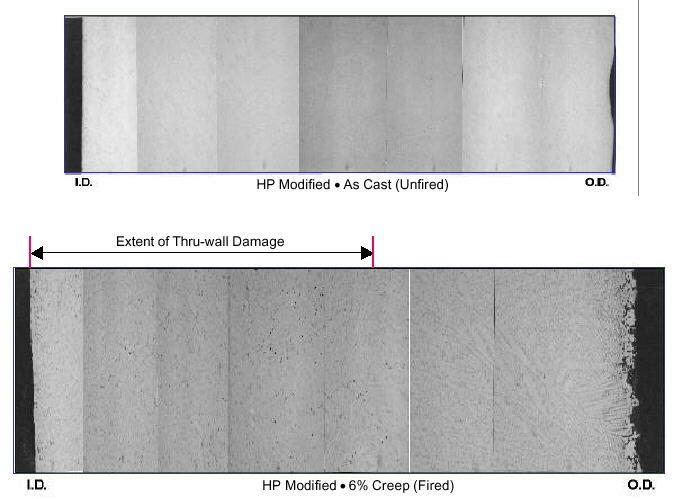 Only the advanced stages of creep damage can be assessed utilizing in-situ replication. Random radiographic examination is normally used as a supplementary technique to confirm the presence of severe cases of creep damage. It is reasonable to expect to locate such damage when it has extended 50% in the thru-wall direction, when the tubes are filled with catalyst and isotopes are used instead of an X-ray tube. Although using an X-ray tube provides an improved quality image, it is not normally employed, because of practical conditions on site. Eddy Current techniques have been used for a number of years on HK-40 and HP-45 tubes. The basic principles of the technique can be found in Reference 3. The technique relies on changes in electric circuit conditions; the circuit being the instrumentation, cables, sensing coil, and the item under test. As the mechanical properties of the test materials change, a change in overall circuit impedance occurs, which is displayed on an oscilloscope. By monitoring these changes, it can be inferred that creep damage is present, based on observation of the signal parameters in comparison to similar changes that occurred on known creep-damaged materials. The depth of penetration of eddy currents is primarily influenced by frequency, conductivity, and relative permeability. Eddy Current coil design is important to obtain adequate sensitivity and signal to noise ratio. Some tubes, such as HP-40 and similar materials that have a high percentage of nickel, require the use of magnetically shielded or biased coils to reduce the effects of material permeability variations. This improves the signal to noise ratio so a reliable test result is obtained, allowing adequate discrimination of creep damage from general material property characteristics. The through transmission technique is shown in Figure 10. The basis is a pitch-catch technique, and it relies on ultrasonic attenuating and scattering due to the presence of creep voids and fissures. The amount of scattering is assumed to be a function of the amount of damage present. 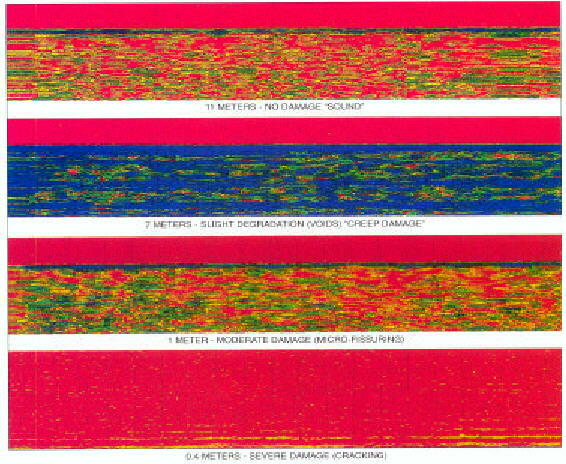 Referring again to Figures 1, 2, 3, and 4, that depict varying degrees of damage, the images outlined in Figure 11 depict the four samples and their responses to the ultrasonic examination. The primary disadvantage of this technique is the influence of tube surface condition, which can vary from smooth, dimpled, tightly-adhering scale, to loose scale, or a combination of them all, that affects the ultrasonic signal and gives the impression of creep damage. This can be clearly demonstrated by referring to the two samples outlined in Figure 6, which depict as-cast and fired samples from the same tube. 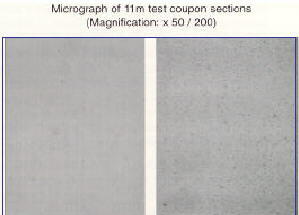 Figures 12 and 13 display the response from the ultrasonic attenuation technique; however, the response from the fired coupon would indicate much less damage than the new or as-cast coupon. This is caused by the signal attenuation due to the surface condition of the as-cast tube. Careful evaluation of a suitable ultrasonic technique is required to demonstrate its suitability for the examination of cast materials. Using an incorrect ultrasonic attenuation technique as a stand alone assessment tool in this case could lead to a significant false call. The scattering based ultrasonic scattering techniques is similar in principle to the ultrasonic backscatter technique used in High Temperature Hydrogen Attack (HTHA) evaluations in terms of the signal shape, amplitude and location of the signal response(6) that the operator evaluates in comparison to signal response from a "sound" section of tube. The ultrasonic backscatter technique used for HTHA determination relies primarily on signal features such as amplitude, shape, and location. The scattering technique utilizes similar signal features. 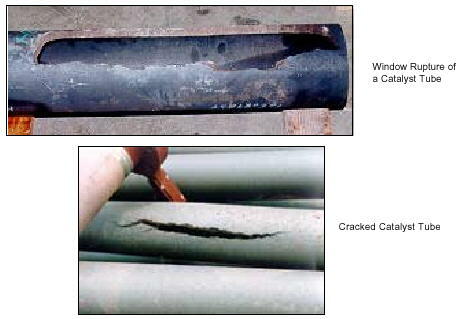 Figure 14 illustrates a "sound” section of tube, and Figure 15 shows a damaged section of tube. Note the high amplitude signals with length. This technique indicates when surface conditions influence the ultrasonic signal. 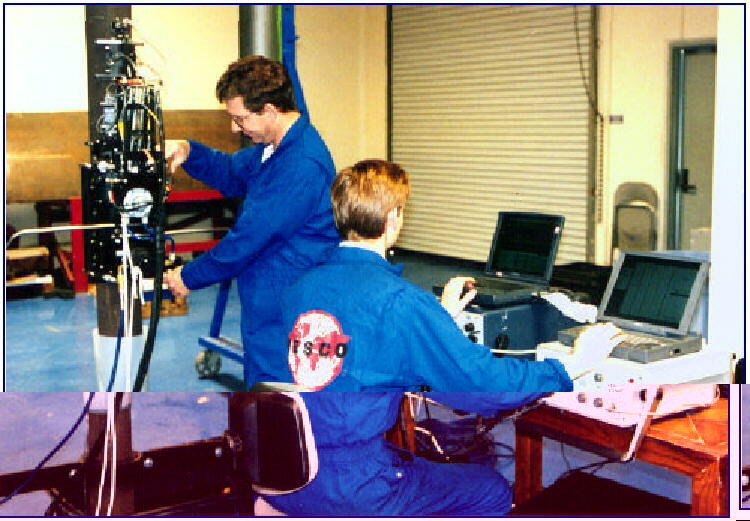 Figure 16 shows the IESCO 'H' SCAN ׂ assembly of carrier and sensors. It takes about 1 hour to set up such a system on-site and 2-4 minutes per tube for data collection and to assign a provisional condition status. The NDE specialists evaluate each tube and assign a damage grade per tube determined on the worst section of tube. These grades are assigned based on comparison of each tube to the NDE responses obtained from samples subjected to metallography at the IESCO facility. Analytical methods can be used to predict reformer tube creep life. The most commonly used method of creep life prediction is based on calculating stress using a simple formula and characterizing material stress-rupture data using a time-temperature parameter. Advanced methods are sometimes used to predict tube life. They use finite element stress analysis and detailed modeling of both material creep and stress-rupture behavior. The most well-known and widely used of the advanced techniques is the pcTUBE™ computer program(14-16) that was specially developed for reformer tube creep life prediction. This section of the paper reviews these methods of tube life prediction and then discusses a new method of directly coupling the advanced life prediction techniques with the inspection results to produce an integrated assessment of remaining tube life. Figure 16. As pointed out previously, reformer furnace tubes are typically designed for a minimum life of 100,000 hours. The design objective is to avoid creep-rupture failures, such as those shown in Figure 17. Design tube life normally is calculated using the methods of API STD 530(17) or similar proprietary company procedures. P is the internal pressure in the tube, Do is the tube outside diameter (O.D. ), D´i is the tube inside diameter (I.D. ), and t is the tube wall thickness. The stress given by Equation (2) is only the pressure-induced mean hoop stress. The variation of stress through the tube wall, the thermal stress, the axial stress, and the effects of cyclic operation are not taken into account by this simplified method. For the tube design temperature and life, Equation (1) is used to compute a value of LMP. Then, Figure 18 or a similar plot for another material is used to find a corresponding value of S for that value of LMP. Finally, Equation (2) is used to size the tube for the design internal pressure, incorporating an appropriate corrosion allowance into the wall thickness. Depending on the relation of the operating pressure and temperature to the design values and the amount and severity of cyclic furnace operation, this method may produce either conservative or non-conservative predictions of actual tube life. The pcTUBE™ program computes stresses caused by pressure, thermal, and axial loading using the elastic-creep finite element analysis (FEA). The FEA model is illustrated in Figure 19. A segment of the tube wall can be divided into as many as 12 elements. Using such a segment of the tube wall is reasonable because the effects circumferential thermal gradients on hoop stress are not significant. (14-15) The accumulation of creep damage in each element is computed during simulated long-term operation. Important cyclic operations, such as start-ups/shutdowns and operating trips, are modeled using a table of input parameters. Stress relaxation and redistribution during steady operation are modeled. Upon initial loading, a through-wall thermal stress is produced by the thermal gradient through the wall. Creep causes the thermal stress to relax and redistribute with time. The repeated process of application of thermal stress followed by stress relaxation and redistribution are modeled during start-ups/shutdowns and operating trips. As mentioned previously, pcTUBE™ contains data for only the cast HK-40, HP -50, and Nb-modified HP alloys. Thus, it cannot be used for wrought materials or other cast alloys. It does contain an adjustment factor that can be used for a material that behaves similar to one of those included in the program. It accounts for slightly increased or decreased creep strength. For example, this adjustment factor has been used to model the behavior of creep-damaged materials or micro-alloyed HP materials. 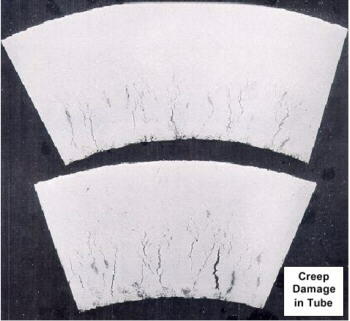 The pcTUBE™ computer program correctly predicts that the maximum amount of creep damage will develop between the inner surface and mid-wall of a tube, as shown by the example in Figure 20. It also correctly predicts that tube life is significantly reduced by relatively small changes in operating temperature or by typical cyclic operation. Tube life is reduced by 50% or more for a 20 to 30÷C increase in maximum operating temperature. Two to four start/stop cycles per year may decrease tube life by 50% or more compared with the ideal case of continuous operation with no shutdowns. Thus, pcTUBE™ has been found to be a valuable tool for predicting the service life of reformer furnace tubes. Operators of reformer furnaces wish to predict the remaining life of in-service tubes. Before the remaining life of the tubes can be calculated, their current condition must be determined. The current condition either can be measured by some destructive or nondestructive test method or calculated using an analytical model, such as the pcTUBE™ computer program. The major drawback of the latter approach is that the uncertainty of knowing the past operating conditions leads to a large uncertainty in analytically predicting the current condition of the tube material. Therefore, it is preferable to measure the current tube material condition and just use the analytical model to predict the future tube life. To provide reliable predictions of remaining tube life, the calculation model used in pcTUBE™ is combined with the results of the 'H' SCAN ׂ inspection. Creep damage and remaining life is computed for each tube in the furnace using inspection results and anticipated operating conditions. The initial damage state of each element (see Figure 19) in the analytical model is set using the inspection data. This approach closely approximates the manner in which damage develops during actual service. The diameter and wall thickness of the tube model also are set using the inspection data. Anticipated operating conditions used in the model include the number, duration and type cycles, outer surface tube temperature and heat flux along the tube, and internal pressure in the tube. Therefore, inspection results are combined with expected operating conditions to predict remaining life. As is illustrated in Figure 21, which shows a plan view of a reformer furnace, the remaining life distribution is determined. Remaining life is predicted for each tube based on realistic inspection and operating data. These predictions are directly coupled with the inspection data to provide an integrated analysis of the furnace tubes. The remaining creep rupture life of each tube is estimated on a realistic basis, taking into account both NDE measurements on the tube and anticipated operating conditions. The calculations are being incorporated into WinTUBE™ software, so results are available shortly after the inspection and in a timely fashion for decision making by the furnace operator. In addition to making predictions for just the anticipated operating conditions, the potential effects of alternative operating scenarios can be rapidly evaluated. Tube condition cannot be determined by one stand-alone technique, as the degree of damage within a particular tube may not lend itself to that specific NDE technique. The reliability of NDE evaluation of reformer furnace tube condition can be improved by combining a variety of advanced NDE techniques ('H' SCAN ׂ Technology) that individually monitor differing physical parameters. The advantages and disadvantages of each technique, when compared against each other, reduces the occurrence of false calls, improves tube condition assessment and can increase overall furnace reliability. Tube lives predicted using simple design methods do not reflect actual operating lives. Specialized stress analysis and life prediction models, such as the pcTUBE™ software, provide realistic service life predictions. These specialized models are not well suited to computing the condition of tubes in service unless past operating conditions are known very well, which is typically not the case. Coupling specialized analytical models, such as the WinTUBE™ software, with NDE results provides a realistic prediction of remaining tube life. Electromagnetic Techniques, Volume 4. ASNT Handbook Series. Birring, A. S.; et al. Ultrasonic Methods for Detection of Service-Induced Damage in Fossil Plant Components. EPRI Funded RP -1865-7. Jaske, C. E.; Viswanathan. NACE Paper #90213. Predict Remaining Life of Equipment in High Temperature/Pressure Service. NACE. Corrosion '90.